Hort. Kew. 1,2 (1789) 431. A much-branched and woody shrublet, up to 1 m high an 0.5 m in diameter. Stems are often covered in the remains of petioles, herbaceous when young and woody with age. Young stems somewhat viscous due to the numerous glandular hairs, initially green, soon becoming grey-brown. Lamina simple, almost tomentose and with numerous glandular hairs, initially green, turning greyish; obtrullate to widely obtrullate, sometimes trifid to tripartite, base cuneate, apex rounded, margin crenate on distal part of lamina, 5-16 x 5-12 mm. Petiole 2-5 mm, semi-persistent. Stipules narrowly triangular, minute, 0.2 x 0.5 mm. Axillary, unbranched peduncle bearing a single pseudo-umbel with 1-5 flowers. Pedicel 2-4 mm. 5, lanceolate, acute, 1-2.5 x 5 mm, hypanthium 8-9 mm. Petals light pink to pinkish-purple, posterior two spathulate to oblanceolate, grouped together, 1.5-3 x 8-12 mm, with dark red to purple markings. Anterior three spathulate, 2-3.5 x 8-12 mm, with short narrow claws. P. exstipulatum forms more or (in the case of the above) less tidy shrubs, and is not a very conspicuous species among the karoo vegetation where it grows. 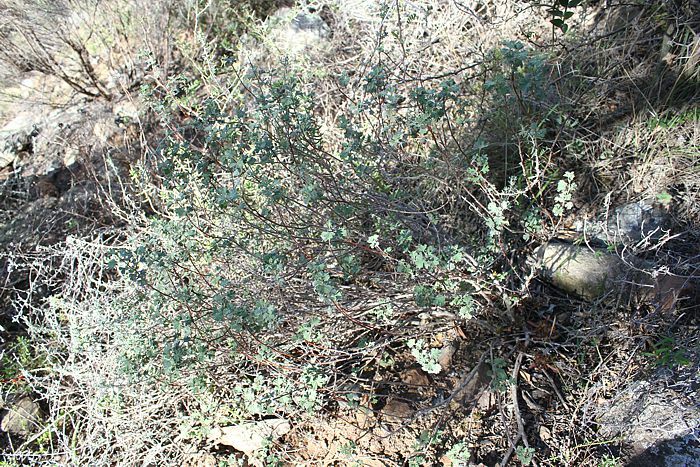 Above is a plant from close to De Rust, growing in the shade of larger vegetation, in an often unmanageable thorny thicket.